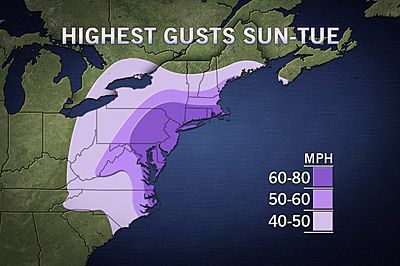 What will be Sandy's effect on economy? Author Frank DiMora lays out a case for Christ as an attorney would do in a court of law to show how God's warning concerning the Psalm 83 and Ezekiel 38 wars are approaching with lighting speed. DiMora asks anyone who is watching the 4 part series to be the jury in this case. You will need to watch all four videos in order to get all the facts to give your verdict. This teaching is something you won't want to miss. DiMora brings in to focus what God has warned compared to the correct events you are watching in the news. Jesus told us to keep on the watch why? Because if you knew what to watch for you would see the very things He told you to watch for. This is what Frank is going to show you. What does the case Frank makes show? Both the Psalm 83 and Ezekiel 38 wars are about to take place! Now for the evidence. you really searching to know the truth? Jesus will show it to you! for depression, or have any type of mental disease consult your doctor before reading this material. Frank DiMora, P.O. Box 732, Lompoc Ca. FREE Bible prophecy documentary book download proving our generation will see the return of the Lord. Do you want to know what is going to happen in the future before it actually takes place? The Word of God provides you with specific details about our future and all of these things are coming to pass in this generation. If you aren’t saved yet this is a must read! the Lord. Do you want to know what is going to happen in the future before it actually takes place? The Word of God provides you with specific details about our future and all of these things are coming to pass in this generation. If you aren’t saved yet this is a must read! The Lord is helping me get the news out check the site below. Once there scroll down and see the blesssing Jesus is giving us. “And I will bless them that bless thee, and curse him that curseth thee: and in thee shall all families of the earth be blessed” (Genesis 12:3). “I will also gather all nations, and will bring them down into the valley of Jehoshaphat, and will plead with them there for my people and for my heritage Israel, whom they have scattered among the nations, and parted my land” (Joel 3:2). 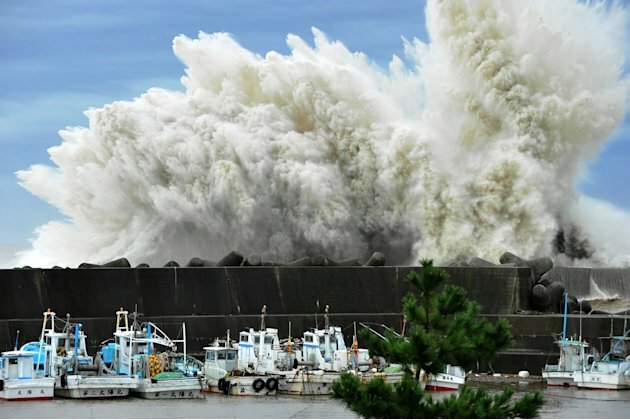 An extremely rare and dangerous storm will turn in from the Atlantic, putting 60 million people in its path and could lead to billions of dollars in damage. 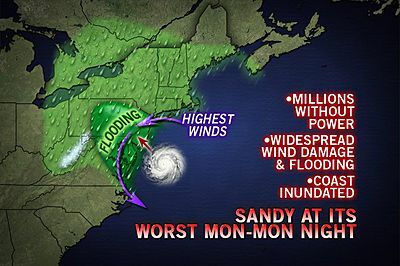 Hurricane Sandy is expected to slam into central or southern New Jersey Monday evening, but severe and catastrophic impacts will threaten the mid-Atlantic and southern New England much sooner. Conditions will deteriorate Sunday into Sunday night with the worst of the storm raging Monday into Monday night. Rain and strong gusts of wind will even expand westward to the eastern Great Lakes and upper Ohio Valley Monday into Monday night. Sandy will weaken over land on Tuesday, but conditions will remain adverse throughout the Northeast, eastern Great Lakes and upper Ohio Valley. center alone in terms of the severity for wind and rain is not recommended. There is the potential for tens of thousands of trees to be downed and millions of utility customers could be without power at some point. Flying debris, including airborne panes of glass in the larger cities will pose a danger. Some secondary roads could be blocked by trees. Depending on the landscape, such as heavily wooded areas, the power could be out for a week or more. Here we go again another huge earthquake has just hit again! GOLDEN, Colorado — A magnitude-7.7 earthquake has struck off the coast of western Canada and a tsunami warning has been issued. There are no immediate reports of damage. The U.S. Geological Survey in Colorado says the quake hit the Queen Charlotte Islands at 11:14 p.m. Sunday local time (0314 GMT) and was centered 96 miles (155 kilometers) south of Masset, British Columbia. Administration (NOAA), Hurricane Sandy churns off the coast of Florida on Oct.
officials who warned millions in coastal areas to get out of the way. Another video is coming where Bill and I teach on the Psalm 83 war and the Ezekiel 38 war. FREE Bible prophecy documentary book download proving our generation will see the return of the Lord. Do you want to know what is going to happen in the future before it actually takes place? The Word of God provides you with specific details about our future and all of these things are coming to pass in this generation. If you aren’t saved yet this is a must read! This book is never to be sold to anyone as it was printed up as a gift to anyone who wants to read it. BEFORE YOU GET TO MY VIDEO WITH TODAY'S NEWS I AM BLESSED TO ANNOUNCE THE LORD HAS BLESSED ME AGAIN WITH A NEW WEB SITE JUST PUT UP BY PASTOR ISRAEL VILA. ISRAEL VILA. FOR YEARS I HAVE BEEN WAITING FOR THE LORD TO SEND ME SOMEONE WHO WOULD HELP ME REACH THOSE WHO SPEAK SPANISH. PASTOR VILA'S SET WILL HAVE MY MATERIAL ON IT IN ENGLISH AND SPANISH AS YOU SEE BELOW. I KNOW JESUS HAS HIS EYES ON MANY SPANISH SPEAKING PEOPLE WHO HAVEN'T BEEN ON THE WATCH AND HE IS GOING TO MAKE HIMSELF KNOWN TO THEM VIA PASTOR VILA WORK AND MY WORK FOR CHRIST. LET ANYONE YOU KNOW WHO SPEAKS SPANISH ABOUT THIS NEW SITE. THE LINK IN BELOW. El propósito principal de este ‘website’ es poder llevarle la Palabra de Dios y presentarle información de los últimos tiempos que muestran claramente cual cerca está la venida de nuestro Señor Jesucristo. Tenemos que entender que el Señor Jesús viene muy pronto para levantar los que son salvos, conocido como el "Rapto." Aquellos que son salvos y preparados, en la búsqueda diaria de Dios; estarán listos para entrar al "Eterno Paraíso" con el Señor Jesús para vida eterna. Cualquier cosa que haga en tu vida esta es la más importante – “no te pierdas esta oportunidad única en la vida”. Jesús está tocando o llamando a la puerta de tu corazón. La salvación es solamente a través de aceptar a Jesucristo como tu salvador personal. The main purpose of this ‘website’ is to bring you the Word of God, and present information of the end times that clearly shows how close the coming of our Lord Jesus Christ is. We must understand that the Lord Jesus is coming soon to lift the saved, known as the "Rapture." Those who are saved and ready, in search of God daily; will be ready to enter the "Eternal Paradise" with the Lord Jesus for eternal life. Anything you do in your life this is the most important - "do not miss this once in a lifetime opportunity." Jesus is touching or knocking on the door of your heart. Salvation is only through accepting Jesus Christ as your personal savior. Esta es una nota especial para cualquier persona que opta por leer este documental de profecía. Este libro fue escrito por Frank DiMora y fue traducido en español por Israel Vila. Fue escrito con la esperanza de que aquellos que den lectura sean conducidos a conocer la Biblia. La Última Crónicas fue escrito con el propósito para ayudarle entender lo cerca que estamos de la segunda venida de Cristo, y lo importante que es para usted comenzar a estudiar la Biblia en preparación al encuentro con Cristo. Millones de personas no saben nada de la Biblia o de la profecía bíblica y no estarán listos para encontrarse con Cristo. Este libro le ayudará a ver exactamente lo que el Señor nos ha enseñado acerca de los últimos días a través de su Palabra. En cualquier momento puede descargar una copia gratuita haciendo “click” en el enlace abajo. Nota: (El enlace arriba es para la versión en español. Actualmente el primer capítulo fue traducido en español y tan pronto que estén listos los próximos capítulos estarán incluidos. A la derecha puede descargar la versión completa en inglés, bajo “Link”; y le llevará a la página web de Frank DiMora y las recientes noticias de eventos proféticos). This is a special note to anyone who chooses to read this prophecy documentary. This book was written by Frank DiMora and was translated in Spanish by Israel Vila. It was written in the hope that those reading it will be driven to know the Bible. The Last Chronicles was written with the purpose to help you understand how close we are to the second coming of Christ, and how important it is for you to begin studying the Bible in preparation to meet Jesus. Millions of people know nothing about the Bible or Bible prophecy and will not be ready to meet Christ. This book will help you see exactly what the Lord has shown us about these last days via His Word. You may instantly download a free copy hitting “click” on the link below. Nota: (Above link is for the complete English version under Frank DiMora website and recent prophecy news events. Currently the first chapter has been translated in Spanish and as soon other chapters are ready they will be included. The Spanish version can be downloaded on the left side, under “Enlace”). Puede descargar haciendo 'click' en enlace abajo gratuito. Download by 'clicking' on the link below for free. © Ministerio Eterno Paraíso 2012 - Todos Los Derechos Reservados / All Rights Reserved. accusations. Sudanese parliamentarians denied that weapons were transported in the area. Take note of this quote in the same report: "Israel was "jeopardizing peace and security in the entire region," he added. Bill Salus Author of Isralestine and Frank DiMora Author of The Last Chronicles of Planet Earth are teaming up in Christ. I have been blessed to announce the Lord has put Bill Salus in my life. This coming Thursday Bill and I will meet for the first time to do a youtube teaching on the last day signs. Mr. Salus is a well known prophecy teacher and has a wealth of knowledge. Bill and I will cover a host of topics such as the signs of the Psalm 83 war, the coming Ezekiel 38 war, events being played out in Syria, Egypt, and Iran to name a few. Mr. Salus has also informed me he will be attending my Palm Springs speaking engagement this coming Saturday. It will be my honor to have him there. I can honestly say that the way Bill and I have come together at this time in our ministries was no coincidence. I am sure Jesus will be using us to lead many to Christ. I plan to have this meeting on video to share with you at my site shortly. I will post more information when it will be posted as soon as I can. I am truly humbled as to what Jesus is doing for me in order to wake up the sleeping Church and to alert the unsaved concerning these last day events. Please pray for Mr. Salus and me as we come together to work for our Lord.